Solid mahogany neck with ebony fingerboard, peg head, overlay and heel cap. Sealed tuning machines (including 5th string tuner). Mother of Pearl position markers for fingerboard. 2 way adjustable truss rod. 11" 3-ply maple pot rolled brass tone ring, 2 coordinator rods, 24 hook tension hoop, No-knot tail piece, and 11" Fiberskyn head. This is a beginner workshop designed for adult participants. Participation is limited to 10 participants for a better instructor ratio. Meals and lodging for the entire workshop is provided. Rustic but comfortable bunk style lodging is provided. A health form (no physical required) and information packet will be mailed upon receipt of your registration form and payment. Master Craftsman, luthier, and teacher Don Kawalek will provide instruction, kits, and a special techniques workshop on inlaying and finishing. 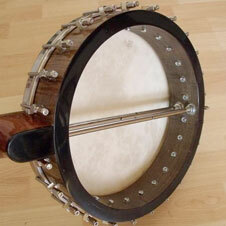 Don is a seasoned instrument maker and master builder with over 40 years of experience. His workshops provide a truly unique experience!